Make a check-off list and follow it in order. Check off each one as it is completed. Don’t say things like “You’re great at this,” “You’re so smart,” or “This isn’t your strength.” Instead, focus on pointing out specific aspects of her work: “You found that pattern really fast, awesome!” or “I like the way you wrote that sentence – the grammar is correct and the words you chose are great,” or “All your practice at XYZ is paying off…” etc. The idea is to get her to think about her actual work-in-progress, not just the outcome (in fact avoid “outcome talk” other than congratulating her on getting through it), and to focus on connecting her work to her improvement. This will build confidence as she starts to see hard work paying off, and attributing the payoff to her own efforts (not luck, or genetics, or things that can’t be changed). NOTE: this recommendation is easier said than done. When you (i.e., parents) are working on hard stuff yourselves, talk out loud about what you are thinking and doing, making sure that the girls hear you. Let them know that you have to work hard too, to get the things done you need to get done. Talk about the steps you go through when paying bills, when getting stuff done at work, and the like. Why this plan should work. Action 1: a student does her homework. Reaction 1: her parents respond to it. Reaction 2: her teacher responds to it. Action 2: she thinks about the responses. Action 3: she does her next set of homework…and so on. Over time, as this cycle continues it will shape a student’s feelings about her abilities. Each step in the plan above contributes something meaningful to the cycle and its contribution is “backed” by theory and research in psychology. I’d like to explain some of this. If you get the gist of how each step contributes to the goal of building a self-confident learner, you ought be able to tailor the plan to your own needs, whether you are a parent/caregiver or a teacher. Steps 1 & 2 reflect Premack’s Principle, a bedrock component of Behavior Modification programs. The principle is fondly referred to in some Psychology texts books as “Grandma’s rule.” Here’s what it is: when you use stuff you like as a reward for doing stuff you don’t like, you end up working harder on the stuff you don’t like (but presumably have to do). Step 1 sets up the contingencies (less interesting/more challenging work first; fun work last), and Step 2 allows the learner to chart her progress Checking items off a list highlights small steps and accomplishments, and makes you feel good too. The “Entity View:” a fixed perspective, where you believe that intelligence and success are inborn and not changeable. You are either smart, or you are not. The “Malleable View:” an incremental perspective where you believe that intelligence and success stem from hard work, thus they are changeable. You are only as smart as you are hard-working. 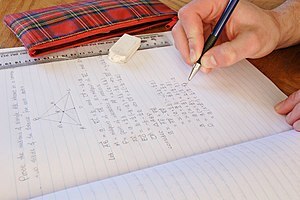 Students’ mindsets come from the way their parents and teachers respond to their school work (i.e., an academic mindset is a form of social cognition – thinking caused by social interactions), thus like confidence, it is as much in your head as it is in the heads of those around you (think of it as shared brain-space). Students’ mindsets influence how they behave and how they interpret the response they receive. The mindsets come from that “action-reaction” cycle. Adult’s responses to students’ work are loaded. To explain what I mean by that, I want to describe Dweck’s original research – it tells a compelling story. She devised a series of experiments done in 5th-grade classrooms, with real, live learners. Students were taken from their classroom individually and taught a very difficult task (it was intended to be hard and something they didn’t expect the children to be able to do well). Students’ work was scored, but the experimenter told each student the same thing — that got 80% correct — followed by one of two remarks: either “You must be smart at these problems” or “You have worked hard at these problems”. After performing, students were given “scores” again, but this time they were told that they only got 50% correct. The researchers ended by asking the students several more questions about their experience including whether they enjoyed the process. The results of this work were striking, and the study design has been modified and repeated over and over again with students of varying ages (ranging from grade school through college). Across all studies, the results are the same. Here’s the typical profile. As you think about the dramatic difference in “learner profiles” remember that the only difference between these groups of students is a one-sentence response from a research assistant! That’s it – just one sentence! All else was the same. This is truly remarkable. Students’ performance, enjoyment, and choices were instantly shaped by one remark. That one remark was loaded. Being the kind of person who learns by doing, I tried this out with my own daughter when she was 2 years-old. We were sitting at the table coloring with markers, and I said to her with much enthusiasm “Honey! You are such a good colorer!” To this remark, she quizzically looked at my picture, looked at her picture, put the marker down and walked away from the table. Wow. Powerful words. I was shocked. So back to Step 3 of my homework plan – I mention in the plan that talking to students in this way is hard. Is really is, in no large part because popular culture in the US tends to have a fixed mindset about abilities. Comments like “What a smart girl you are!” and “Look at that – he’s a natural!” and “I swear she was just born that way!” regularly roll off the tongues of well-meaning parents. This comes from the US’s love affair with self-esteem (for more on that issue, click here) – we are told that boosting our children sense of self is motivating. Research like Dweck’s shows just the opposite. Let’s consider the “hidden message” behind “Fixed” vs. “Incremental” ways of responding to our children so we understand why esteem boosting with fixed words is dangerous. In short, over time these kinds of responses are motivation and confidence killers. With strong, self-determined motivation children work hard, earn positive responses, and gain confidence as a result. In short, over time these kinds of remarks are motivation and confidence builders. The key to this process is to do just that – emphasize process with students. “Keeping the eye on the prize” isn’t what you want students to do; rather, you want them to think about how to get to the prize. Emphasize each step they engage in and downplay outcomes in as much as is possible. Point out improvement and talk about what caused the improvement. This is another reason why I suggested making a check-off list (Step 2) in my homework plan. Without a check-off list, kids focus on the end point, not the steps necessary to get there. This suggestion stems from decades of research on Observational Learning Theory and grandmothers’ rules alike. You know the saying, “Do as I say, not as I do?” Well, turns out it is true. Children learn all kinds of things via observation and they often pay more attention to actions than to words. Even more importantly, they notice when adult’s actions and words don’t match. My 2-year-old noticed it when I commented on her coloring – objectively, my picture was better than hers, so I’m sure that in her 2-year-old way, she wondered what on earth I meant when I said she was good. Not only do parents need to be consistent in their words and deeds, they also need to think about how their words and deeds represent their own mindsets about learning and success. Parents need to “say and do” all they can to instill in their children an incremental mindset. If children only see their parents do things correctly or well, without realizing the fact that parents learn too, they assume parents have always done it right and the seeds for a fixed mindset take root. On the other hand, if children see their parents work hard, make mistakes, then try again until they get it right, parents are planting seeds for an incremental mindset. A homework plan like the one I suggested to my brother should plant the seeds of change and allow any learner to build confidence in her scholastic abilities. When learners (of any age or ability) work in an environment that promotes an incremental mindset, they are set up for success. I welcome your comments: If you decide to give a plan like this a try, please let me know what happens. Thanks! This is an excellent synopsis of methods of dealing with the “homework problem.” Also, thanks for the book recommendation. I’ll be ordering that one! Thanks. Glad you liked it. Nurture Shock is a great book too, enjoy! I also really enjoyed Nurture Shock! This is great Erica! When I was in college in a philosophy class looking at different ethical standpoints, I was most interested in Aristotle, following the logic that one’s reason for pursuing a destination was for the sake of the pursuit (“the journey IS the destination”). And I think “growing mindsets” is a phrase that can even be separated a bit from the rest of these terms, too, in my experiences. The way you just phrased it, I think about people “going through a phase” – I recently had a conversation with a friend about how I am completely aware of how differently I handle things now in comparison to just eight months ago (while still retaining the same base goals and passions), and she was arguing that she hadn’t changed much at all in that amount of time. I asked her about different scenarios that I knew she wouldn’t have taken part in eight months ago but would have done now, and she picked up a little more about what I was thinking. It’s interesting – we’re trained to think in such absolutes that change becomes scary, even to the point of forcing people to not acknowledge how they’ve changed over time even if that change is good or painfully easy-to-identify. And on top of that, people feel that the consistency of their base passions are enough to back up the “fact that they haven’t changed,” though I’m much more a fan of balancing one’s lifestyle with consistent underlying goals/passions mixed with more fluid, temporal methods of exercising those passions. Yes, absolutely! The fact of the matter is that we are in constant fluctuation, in response to the people and ideas we are currently surrounded by. I spend a lot of time talking about that in a class I teach called “Memory and Mind” – students often balk at the idea first, just as your friend did, but as we go over the research and reflect on it, they come around to the idea. Once you see the fluidity, you can’t not reflect on it. If you (or your friend) are curious about that idea, I’ve written more about it in a post titled “I am me, thanks to you“.